Before your holiday gets underway, why not indulge yourself at the Leonardo hotel? This 4-star, newly-refurbished hotel is sure to help you unwind with everything it has to offer. You can get those muscles moving at the gym or go straight to the spa where you can choose from a wide selection of treatments  they have everything from manicures to massages! When you get hungry, head to the hotel's Destination restaurant for a delicious dinner. Whether you're a steak and burger person, or you prefer salads and soups, there will be something on the menu that's sure to have you salivating. After dinner, you can finish off the evening with a few drinks at the bar before heading to bed, where the triple-glazed windows will block out the noise to help you sleep soundly. 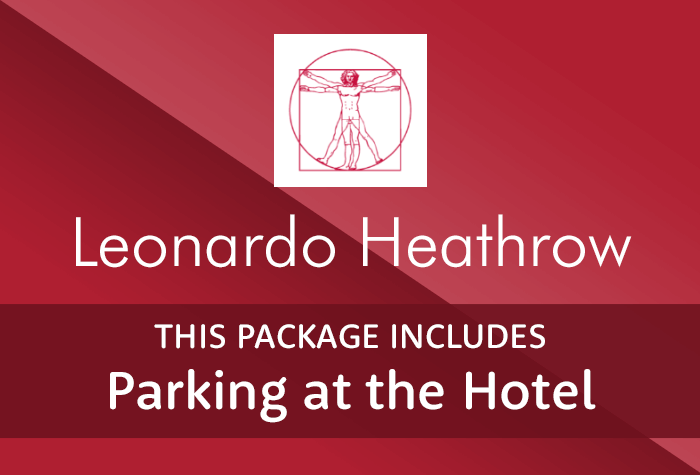 If you're looking for a classy, yet comfortable hotel experience then the Leonardo hotel is the ideal Heathrow airport hotel for you. Carpets in room grubby Toilet bowl not properly cleaned. Some staff had no English. Taxi booking and service excellent. Reception staff very helpful. More noise during night from other guests than from the airfield across the road. The hotel itself is clean, comfortable and its a perfect location to get to Heathrow. My sister was greeted by one of the receptionists who was rude and didn't seem to want to help. The receptionist who checked me and the rest of the group in was very nice, however we were told in order to get to Terminal 2 we would need a taxi and because there were 7 of us, it would cost £20.. At the time I was tired after a long journey and just wanted to get my head down, so I agreed to get one booked etc.. It wasn't until we were in the taxi the next morning, that I realised the website advertised a free shuttle service to and from Terminal 2. Why this wasn't told to us when we checked in, I have no idea. So an extra payment we shouldn't of had! Our customers rated Leonardo on average 9/10 (80 reviews). Read Leonardo reviews. Hit the gym, dine in style or kick back and relax at the spa - you'll be spoilt for choice at this classy but comfortable airport hotel. The Leonardo hotel is a 20-30 minute bus ride away from T2, T3 & T5, or 5-minute taxi ride at a cost of £10. Driving instructions and a postcode for satnavs will be on your confirmation. Check-in is from 14:00 and you need to check-out by 12:00. Drive to the hotels car park. Park and head inside to check in. Youll need to leave your keys at reception in case your car needs to be moved to a secured car park close to the hotel while youre away. There is free wifi in all public areas of the hotel. Bedrooms at the Leonardo hotel are bright, comfortable and spacious. All rooms have triple-glazed windows, their own bathroom, a TV and free wifi. The hotel has a gym and a spa - perfect for getting into shape or relaxing before your flight. The gym is open 24 hours a day and the spa is open from 12:00 - 21:00 every day. Access to the gym is free for guests and you can also book in spa treatments for an extra cost. The Leonardo hotel has one restaurant, the Destination restaurant. The menu offers a range of freshly prepared dishes from soups, salads and deli sandwiches to burgers, steaks and sides. If that wasn't enough, they also offer a choice of tempting desserts, as well as wines from around the world. Dinner is served between 18:00 and 22:30, so there's plenty of time to grab a bite before bed. You can add dinner to your booking on the next page. For smaller meals, head to the bar. The Leonardo hotel has 1 bar, serving beers, wine, spirits and soft drinks from 06:00 to 01:00 every day. Light food is served until 22:00 every day. A breakfast buffet of Continental and cooked items is served from 06:00 to 10:30 during the week and until 11:00 at weekends. It costs £16.95 per person if you pay on the day, or just £13 if you pre-book the night before. The Heathrow Hoppa shuttle bus runs regularly during the airports opening hours to T2, T3 and T5. The bus stops at other hotels on the way, so it can take between 20 and 30 minutes. If you're flying from T4 you'll need to catch the free Heathrow Express from T2. If you need assistance getting through the hotel or to the bus, the hotel can arrange this for you. The hotel has 12 rooms that are accessible to disabled guests and a disabled parking bay. Disabled facilities The hotel has 12 rooms that are suitable for travellers with less mobility and a disabled parking space. Drive to the hotel - your confirmation will include directions and a postcode for satnavs. The Hoppa runs from 4am to midnight to T2, T3 and T5. If you're flying from T4 you'll need to catch the free Heathrow Express from T2. Bus times depend on your hotel and the terminal youre flying from. More information on these will be in your booking confirmation, or you can ask the hotel when you arrive. Journey times vary depending on your hotel it can take between 20-30 minutes. If you prefer, a local bus also serves the airport. It is free to use and runs from just outside the hotel. Catch the Hoppa back to the hotel. No need to call Drivefly when you are on your way. They have a designated Drivefly desk located in the short stay car park with friendly chauffeurs waiting to accept your car. If you think you are going to be more than 30 minutes late, please call them on 0203 667 2616 or 07545 004 379. Drive to the Short Stay car park any time between 4am and 12am to meet your driver - your confirmation will include directions and a postcode for your satnav. Please note, the car park closes at midnight and if you arrive after this time there will be a £50 charge. You'll need to give them your booking confirmation and car keys, as well as your return flight information. From there, it's a short walk to the terminal while the driver parks your car in a secured car park. Once you've collected your luggage, walk back to the Short Stay car park to collect your car.